Many people think that the best rifle scopes are the ones that cost thousands of dollars. Today, many manufacturers produce affordable and quality rifle scopes that provide the same performance as the high-end models. If you want to boost your telescopic accuracy without spending too much money, get the best rifle scope under 100. In as much as you might forego some advanced features that are found in rifle scopes that cost more than 1000 bucks, affordable rifle copes have the basics features that you need for the best price. 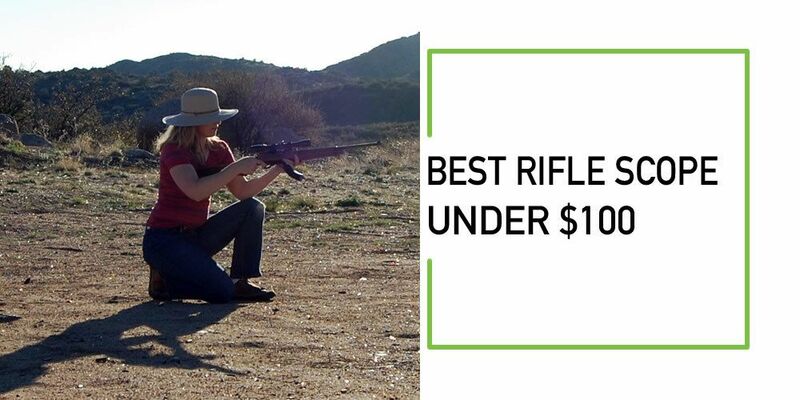 I will take you through reviews of quality rifle scopes under 100 bucks that perform well, are sturdy and give you the best aiming facility. N.B: Price in between $100! Purchasing a quality and cheap rifle scope is the best thing you can do to your wallet. But how will you know which is the best model to pick? Do not worry because I have done the research on your behalf and here provide you with reviews of top quality rifles scopes on the market today. Make your shooting accurate with the UTG 3-9X32 1" BugBuster Scope. 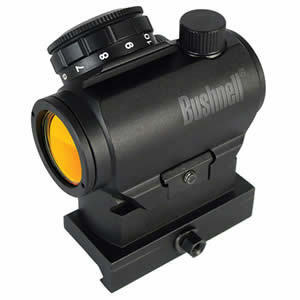 This is an affordable rifle scope that is designed to provide you with the best aiming performance. This is one of the best scopes that provide you with a clear view of your target because it is completely nitrogen sealed. 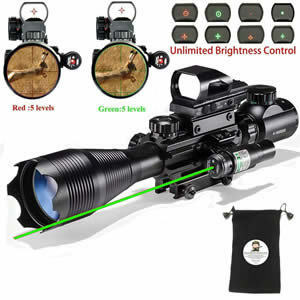 It has a magnification of 3-9xand provides you with green and red illumination making it versatile. You can depend on the scope to provide you with a better vision even in low light situations. When you buy the scope, you will get flip-open lens caps, 2inch sunshade, and quick detachable rings. This rifle scope features a range estimating mil-dot reticle that provides you with the best performance when shooting. Additionally, you will love its long and accommodating eye relief that suits people with glasses. 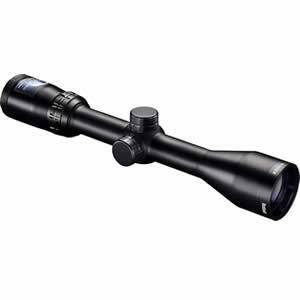 Considering its price, you will be impressed with the quality construction that makes the scope durable. It is rainproof, shockproof and fog proof. Finding a perfect rifle scope on a budget can be difficult. You don't want to spend less and then compromise when it comes to quality. This is why Bushnell provides you with one of their best rifle scope that gives you the best view. Bushnell Optics TRS-25 scopehas 1x magnification and comes with multicoated optics so you can expect bright and clear images when you are hunting. The optics feature an amber-bright high contrast lens coating that offers effective light transmission. It gives you 11 brightness setting to achieve optimal illumination in different lighting conditions. This scope is lightweight making it effective to work with. It has solid and strong construction to give you many years of use. Another thing that you will love about the scope is the unlimited field of view. To conserve the battery life, this scope powers down when you attach the protective hood. BARSKA is one of the best brands on the market that provides you with quality rifle scopes and other related products. BARSKA 3-12x50 is a popular rifle scope that is recognized for its rugged and durable construction, accuracy and advanced optic technology. This is a great scope that will help you achieve the best view under low light situations. It is an all-purpose rifle scope that works well for hunting, target shooting and plinking. The scope is designed with a large objective lens that offers increased light transmission. The multi-coated optics ensures that you get crystal clear images. This scope also provides you with a powerful magnification of 3-12xwithout altering the image quality. It is designed with a strong construction and it is also fog, water and shockproof making it durable. 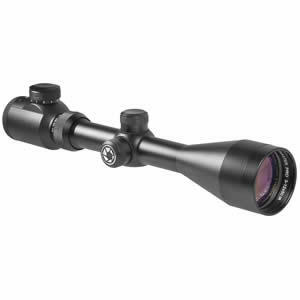 Unlike other scopes, this model utilizes an advanced optic technology to offer you an incredible performance. Again, you will love its long eye relief of up to 2.7 inches that many users find comfortable. If you want to improve your performance when shooting, equip your rifle with the Hunting XOPin Rifle Scope Combo. 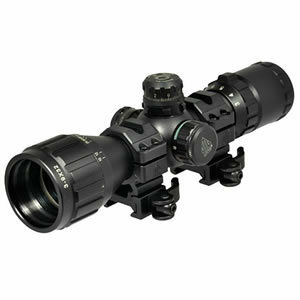 The scope provides you with a powerful magnification of 4x-16x that works well with many W/22 mm rail mount Picatinny. It is designed with optical coated reticles that are illuminated in green and red and also have different brightness intensities. You can be sure of getting the best views even in poor light conditions. It has a red laser and sight to allow you to get a good view of fast moving objects. The scope features a larger objective lens measuring 50mm to effective light gatheringand 4-16x magnification to help you see your target clearly. You will also enjoy a wider field of view of up to 100 yards and a long eye relief of 3 inches- 3.4 inches. When it comes to construction, it features a quality aluminum construction making it ideal for outdoor use. The scope is also waterproof, fog proof and shockproof. Are you looking for a beautiful, durable and well-designed rifle scope? Consider the Bushnell Banner Dusk & Dawn Multi-X Reticle Riflescope. The scope provides you with a powerful magnification of 3-9xso you can see your target objects well. With its 40mm objective lens and multicoated lenses, you can expect bright and clear images all the time. It has high light gathering capabilities to ensure that you get quality images when aiming at your target. You should always consider the durability of a rifle scope before you purchase. You want to end up with a quality model that will last many years. This model features a fog proof and waterproof construction making it long lasting. It is made with quality materials that have been tested. This scope is designed with a fast focus eyepiece and features resettable windage as well as elevation adjustment. When choosing affordable rifle scopes, it is important to consider the quality and other important features so that you can get a great value for your purchase. The following are some important things to keep in mind when purchasing a rifle scope under 100. Durability: The fact that you are buying a cheap rifle scope doesn't mean that you should compromise on the durability. You want to get a quality rifle scope that will serve you for many years. Check to see of the rifle scope is strong enough to handle recoil and terrains when you are out hunting or shooting. Eye relief: You should also consider the eye relief. In as much as you are going cheap, this doesn't necessarily you should not get the best eye relief. If you ignore this feature, then you will experience a black eye when viewing. Field of view: A rifle scope that provides you with a wider field of view makes it easy for you to see your target. A scope with a good field of view should allow you to see from a distance of up to 100 yards. Exit Pupil: When selecting a rifle scope under 100, make sure the exit pupil is between 3-5mm. if you get a model with an exit pupil that is less than 3mm, then you will end up losing more light gathering capabilities. Light Transfer: When it comes to the light transfer, the more the lenses a scope has, the better the light transfer. The amount of light that you get is crucial when you are shooting in low light conditions. If you choose a scope that doesn't have more light transfer, then you can compromise your view. Accessories: Does the rifle scope come with important accessories? You will find that most affordable rifle scopes come with extra accessories for ease of use. Check out the type of accessories that are included in your rifle scope. Rifle scopes are essential items for hunters and shooter who want to get increased accuracy when shooting. If you are on a budget and need a great rifle scope with basic features to get started, the above models will be worth your investment. You can compare their magnification, power, focal ability and other features to find which one suits your needs well. Be sure to get an incredible performance from any of these rifles scopes I have reviewed above. Best Rifle Scope Under 500 – Top 5 Scopes Reviewed by Expert!